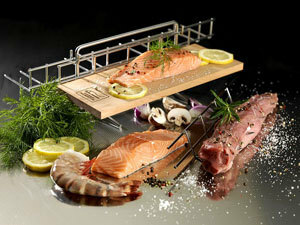 With the MULTI 2 and MULTI 4 you can cook one-portion fish to perfection. Through the unique fixing into place on the fish holder the fish do not come into contact with the cooking or grilling appliance (grill rack). The skin of the fish remains intact. 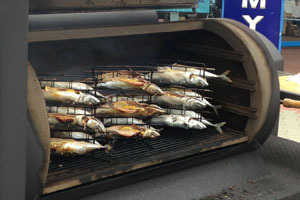 As the fish is cooked on its back the juice stays in the fish and can therefore develop its tender aroma. 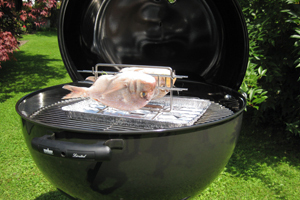 Gourmet Fish Grill MULTI 2: Model for 2 fish, L: 12" / W: 7" / H: 4.9"
Gourmet Fish Grill MULTI 4: Model for 4 fish, L: 12" / W: 7" / H: 8.5"
MULTI 2: Also suitable for kettle grills! 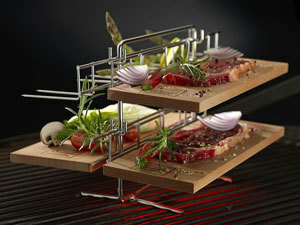 The MULTI consists of a stand with 2 rotating feet and 2 or 4 fish holders with 4 skewers each for hanging into the stand. You are also supplied with a hand lifter for handling and serving. 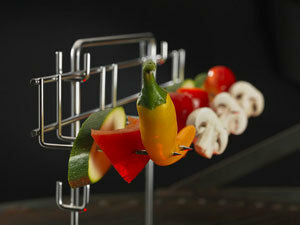 All parts are made of stainless steel and can be cleaned in the dishwasher. 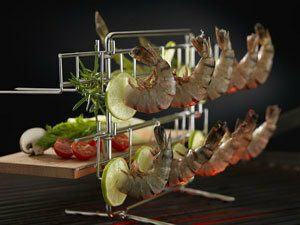 2 Fish holders with 5 skewers each for fish up to a length of 16 inches. Suitable for both models. 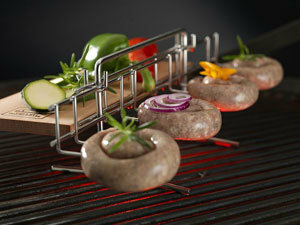 Tip: You can skewer and grill or cook indirectly every type of barbecue food, e.g. chicken wings, scampi or sausages.